Slayer Sign To Nuclear Blast, Plus New Free Track! Awesome. 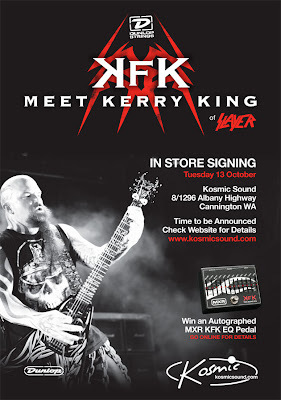 My pals at AMS, Aussie distributors of Dunlop/MXR, just alerted me to the very cool news that Slayer’s Kerry King will be appearing at Allans in Melbourne and Kosmic Sound in Perth while in Australia for the joint Slayer/Megadeth metalfest. I can’t wait for this gig! Megadeth and Slayer haven’t had the friendliest of relationships over the years (especially Dave Mustaine and Kerry King, the latter of whom actually played some early gigs as a fill-in member of Megadeth). 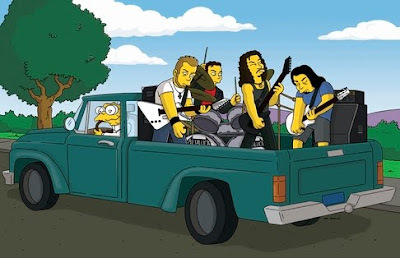 Back in the day they brought along Anthrax and then little-known opening band Alice In Chains for the Clash Of The Titans tour. Now Slayer and Megadeth will put their differences aside to get all metal on a whole bunch of lucky Canadians. Here’s the press release. Monday, April 27, 2009 — Talk about a mind-blowing line-up. Slayer and Megadeth – two of the bands that defined the thrash/metal genre – will perform together for the first time in more than 15 years when they co-headline four shows in Canada in late June. 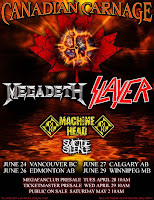 The tour, dubbed “Canadian Carnage,” will also feature Machine Head and Suicide Silence, and will see Megadeth and Slayer each closing two of the four shows. Tickets will go on sale Saturday, May 2, and will be available at all Ticketmaster outlets and at Ticketmaster online. Few bands come close to matching the intensity that Slayer brings to its live shows, having been named “Best Live Band” by numerous media outlets including Revolver, SPIN, and Metal Hammer. Slayer – guitarists Kerry King and Jeff Hanneman, vocalist/bassist Tom Araya and drummer Dave Lombardo – is currently in Los Angeles recording its as yet untitled tenth studio album with Greg Fidelman producing and Rick Rubin executive producing. Fans were given an early taste of the brutal new Slayer material when “Psychopathy Red,” a song inspired by the heinous Russian serial killer Andrei Chikatilo, who confessed to savagely murdering 56 children, was recorded last October and then leaked online. Attendees of “Canadian Carnage” will be treated to Slayer performing “Psychopathy Red” live on stage. Plans are to release the new album in July, in tandem wi th the Mayhem Festival tour Slayer is co-headlining with Marilyn Manson. With over 20 million albums sold worldwide, the icon that is Megadeth culminated earlier this month, with Dave Mustaine’s acceptance of the highly coveted “Golden God” accolade and the band’s headline performance at the inaugural Revolver Golden Gods Awards in Los Angeles. Megadeth – lead guitarist/lead vocalist Dave Mustaine, lead and rhythm guitarist Chris Broderick, bassist James Lomenzo and drummer Shawn Drover – is currently recording their 12th studio album in Los Angeles with Andy Sneap. The disc is scheduled for release later this summer to coincide with a full scale world tour. Known for their ferocious live show, Megadeth will once again bring this intensity to their loyal throng of Canadian followers. Bay Area titans Machine Head add to the carnage as main support. Machine Head – vocalist/guitarist Robb Flynn, guitarist Phil Demmel, bassist/backing vocalist Adam Duce and drummer Dave McClain – are currently touring in support of their critically-acclaimed and Grammy nominated The Blackening. Since its release, the band has been awarded both Best Album at the Metal Hammer Awards and Album of the Year at Kerrang’s annual ceremony that same year. And with a fan base so rabid, they’ve actually been banned from certain U.S. venues, Machine Head will bring with them the relentless stage show they are renowned for. There is little doubt in anyone’s mind that Suicide Silence is one of the frontrunners of the new wave of American metal, a statement further validated as the group won the “Best New Talent” award at the inaugural Revolver Golden Gods Awards, held at Club Nokia in Los Angeles on April 7. The group was also hailed as the event’s breakthrough artist by the L.A. Times, but make no mistake that this extreme juggernaut is not resting on its laurels and is about to take things up a notch with their highly-anticipated sophomore release, No Time to Bleed, which was produced by acclaimed producer Machine (Lamb of God) and set for a June 30 release. There will be a special FAN CLUB EXCLUSIVE Megadeth/Slayer “Canadian Carnage” concert tickets PRESALE held Tuesday, April 28 at 10AM! Fan club members, log in to the fan club Tuesday morning, click on “Tour” then “Tickets”. You will be provided with links to purchase your tickets from along with a password emailed to you late Monday. Tickets will go fast! Don’t delay! The ceremony will be broadcast on MTV2 as a one-hour special debuting Saturday May 2, and will feature performances from MEGADETH, KILLSWITCH ENGAGE, HATEBREED, ALL THAT REMAINS and SUICIDE SILENCE. It will be hosted by Brian Posehn (The Sarah Silverman Program). CLICK HERE to see Epiphone guitars on eBay. CLICK HERE to subscribe to Revolver through Amazon.com.